Saturday, April 27th: Stories of Sleepovers at The Pickle Jar! 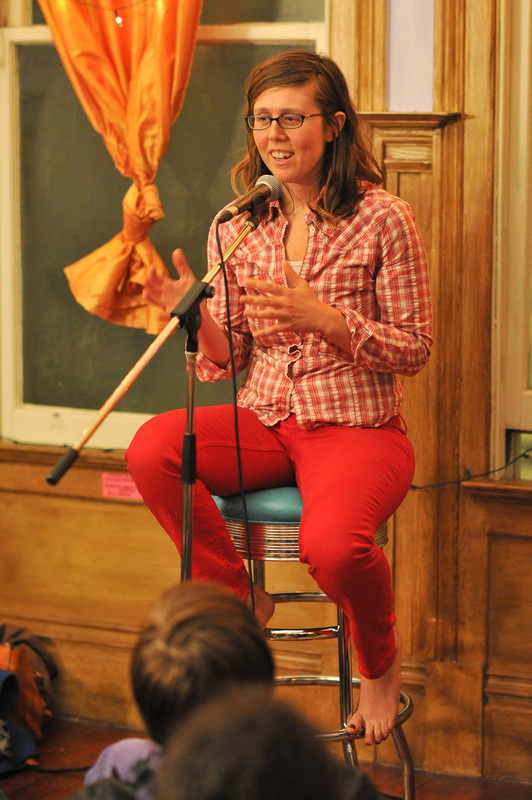 Elizabeth Simone tells her TMI story in January 2013 at The Pickle Jar! Spokespeople is this Saturday, people! Join us for an evening of true stories told live without notes at The Pickle Jar. The theme is Sleepovers. Got a story about sleep-away camp? Slumber parties? Waking up in a weird place? We’ve got a couple storyteller spots still open — get ’em while they last! E-mail rebecca.stievater@gmail.com to sign up. Keep in mind that The Pickle Jar is a co-op, and they are graciously willing to host us in their home for a second time. You’re welcome to bring your own food/drinks, and we’ll have some light appetizers available. Email rebecca.stievater@gmail.com to sign up to tell a story! Also, join us for our next bike ride on Sunday, May 5th! We’ll be doing an approximately 25-mile ride around San Pablo Reservoir (a ride affectionately known as “Three Bears”). Bring layers, water, your bike, snacks, and helmet! Some of us will be wearing spandex, but it’s not required. No drop pace = all speeds welcome! RSVP to rebecca.stievater@gmail.com so we know to expect/wait for you! Thanks for your continued interest and support of Spokespeople! Tags: Pickle Jar, Sleepovers, spokespeople, spokesppl, storytelling. Bookmark the permalink.